PHOTOS: France Begins Evicting Thousands Of Migrants From Notorious 'Jungle' Camp : The Two-Way French security forces intend to dismantle the squalid camp that, despite its poor living conditions, has housed thousands of people who fled wars or poverty for a better life in Europe. 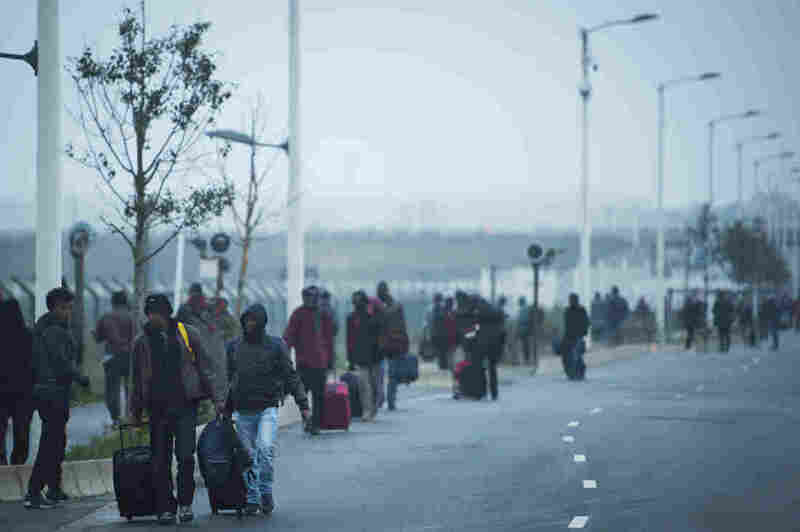 Migrants arrive to register for relocation at a temporary facility outside The Jungle refugee camp near the port of Calais, France. The camp known for its squalor housed an estimated 6,100 migrants. 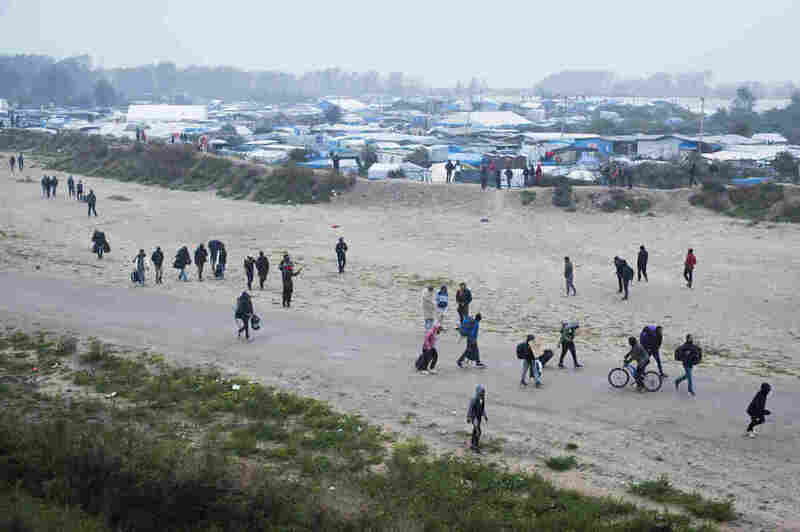 French security forces have started evicting the thousands of migrants living in a notorious camp known as "The Jungle" near the port of Calais. 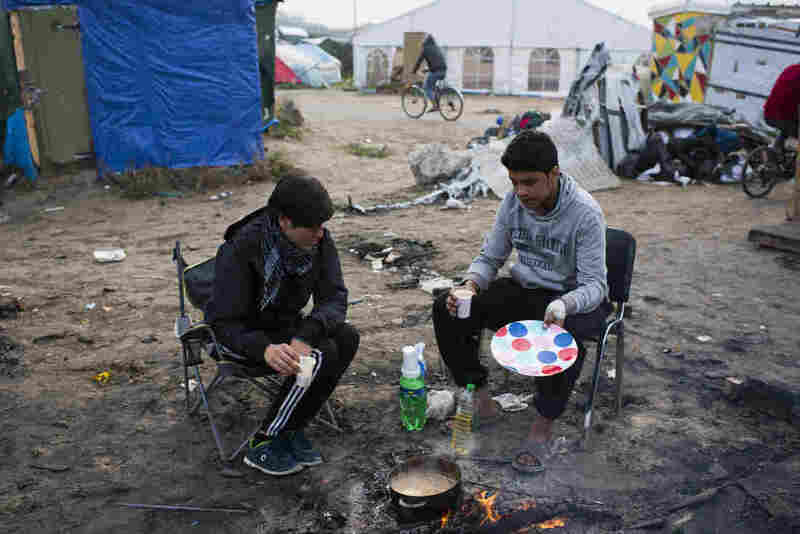 Authorities intend to dismantle the squalid camp that, despite its poor living conditions, has housed thousands of people fleeing wars or poverty for a better life in Europe. Many hope to reach the U.K. — which lies just 26 miles away across the English Channel. Others are seeking asylum in France. A stream of migrants leaves The Jungle on Monday. Authorities have begun processing and evicting refugees; destruction of the camp is slated to begin Tuesday. NPR's Soraya Sarhaddi Nelson was at the camp and says that despite concerns about violence, the eviction process went smoothly on its first day. "What we're seeing is a steady stream of migrants who are coming out of this camp, going up the road to where police have set up registration centers," she says. "A lot of rolling bags going past — it almost feels like its an airport or a train station or something." The French Interior Ministry says some 2,300 migrants were voluntarily uprooted from the camp on Monday, Soraya adds. A spokesman for the ministry said none of them were "being forced to leave the camp or get on the buses, at least not yet." However, many migrants — like Issa Jabakheir from Afghanistan — say they don't feel like they have other option but to leave. "What choice do I have? The police are going to bulldoze the camp," he tells Soraya. At registration centers, people were given two choices: east or west France. 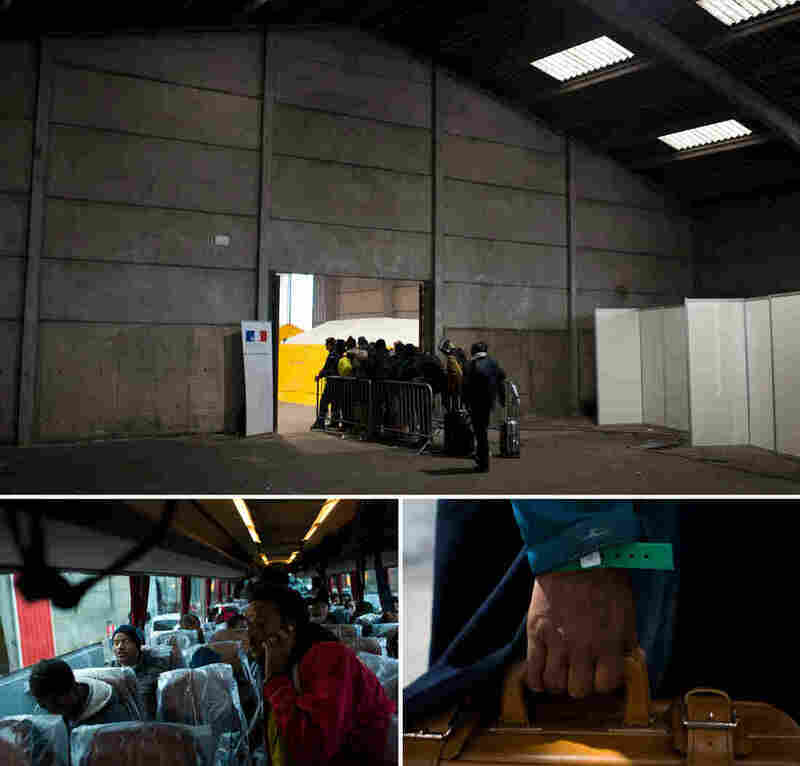 Soraya reports: "And once they've selected one of those regions, the authorities pick out one of the towns where they've set up refugee homes or centers." 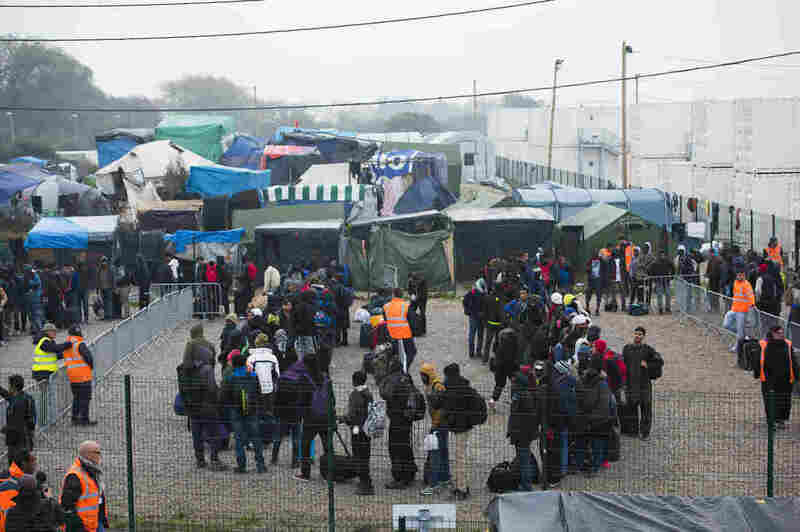 Buses carrying migrants have started moving from the camp to areas around France, Soraya notes. The approximately 450 homes or centers across the country "are intended to be temporary" and "will each hold 40 or 50 people for up to four months while their asylum cases are examined," as The Guardian explains. 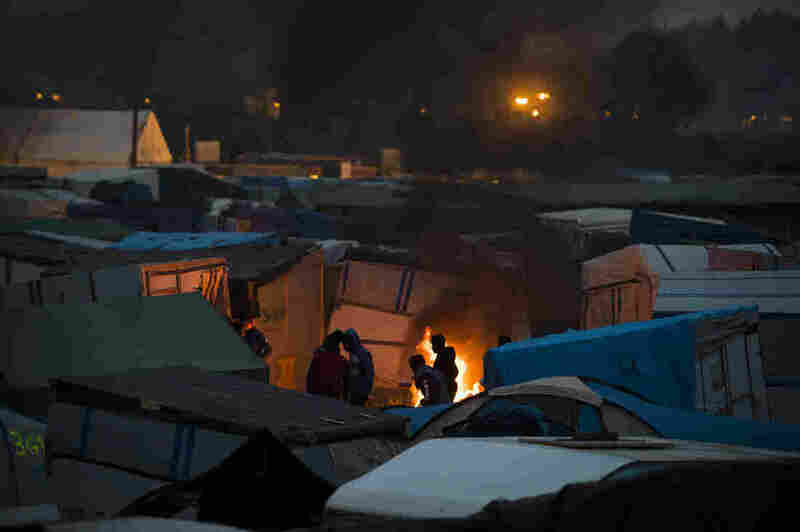 However, "those who do not claim asylum will be sent back to their country of origin," according to the newspaper, and "almost two-thirds of those surveyed in the camp have said they do not want to be evicted and taken to French accommodation, while one-third say that they will continue to try to get to the U.K."
An estimated 6,100 migrants live in the camp, Soraya reports, though aid workers say the number likely is much higher. Most of them are young men from Afghanistan and countries in Africa. Soraya adds: "So the question becomes, if in fact there are 8,000 or 10,000, what happens to the remaining 2,500?" Some migrants say they intend to hide within the Jungle, in hopes of avoiding being moved to another place in France, Soraya reports. Over the weekend, police fired tear gas at stone-throwing migrants. And Soraya says there are concerns that tensions might escalate as authorities tear down the camp. "I think it's to be expected that as they start to raze the Jungle, that you're not going to have as much peacefulness," she says. "If police catch people, then it might not be as friendly as it is now." Refugee advocates are particularly concerned about what will happen to an estimated 1,300 unaccompanied minors living in the camp. "About 200 have been sent to England, in large part to be reunited with family members there," Soraya says. And the remaining 1,100 are "going to be put into special housing for unaccompanied minors in close to 300 centers in France." It remains to be seen whether they will be allowed to travel to the U.K.
Soraya adds that in an operation several months ago, 129 children went missing, and it remains unclear what happened to them. The migrant camp is viewed as a disgrace. NPR's Eleanor Beardsley says the name "The Jungle" stems from the level of squalor and chaos there. 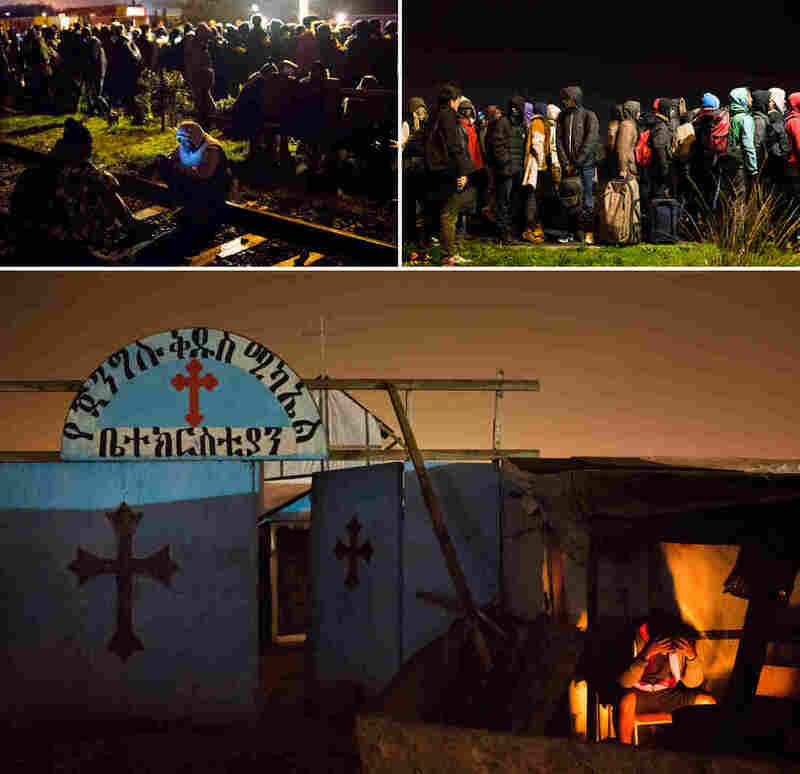 Authorities hope the current eviction process will stand in contrast to what happened in March, The Associated Press reports, when they dismantled the southern half of the camp in a "chaotic, even brutal bulldozing operation that drew complaints from human rights groups."